New to Lift-Accessed Mountain Biking? Let our trained coaches set you up for fun and success! Coaches will help build a solid foundation of riding skills where you can progress to the next level. From beginners to seasoned pros, Highland is all about training and trails. To help you make the most of your first visit we’ve answered some of the common questions we receive from riders. What program should I start with? One full-day Park Ready™ bike rental (Specialized Enduro Comp) Kids Bikes are also available. You may also consider our Find Your Ride™ 3-Pack. For just $299, you’ll gain confidence and experience over three all-inclusive Find Your Ride™ visits. We recommend comfortable clothes, as if you were going for a hike, along with athletic shoes and socks. For protection, we rent full-face helmets, knee/shin pads, elbow pads, and Five Ten rental shoes. If you would like riding gloves or goggles please bring them with you, or you can buy them in the bike shop if you wish. If it is raining, bring a rain jacket and a change of clothes. Bring your ID and please have a credit card available if you are taking a Find Your Ride™ lesson or renting a bike. Come dressed ready to ride! See “What Should I Wear” on what to wear to the mountain. Can I ride my own bike or do I need to rent? If you have a front suspension bike, you will be able to ride most green and blue trails. We recommend a full-suspension, freeride-specific bike to maximize the riding. If you do not have a bike, the Highland Demo Center has you covered with a fleet of bikes ideal for learning to ride downhill. What do I do when I arrive at Highland? When you exit your car, you will enter the main lodge on the left through the glass doors. When you enter, look left towards the ticket/ Find Your Ride desk. From here, if you have your own gear, you will head off to the lift. If you are taking a lesson or need rental equipment, you will head downstairs and get your safety gear and your bike. This is where your journey begins. How do I get my bike to the top of the mountain? The thrill of riding Highland is the gravity fed trails. You use the lift to get you and your bike to the top of the mountain. Our lift is similar to what you would see at a ski resort, only half of the chairs are customized to carry up to three bikes at a time. Our lift attendants and Find Your Ride™ coaches will assist you — don’t be afraid to ask for help! Can I ride clipless pedals? A lot of riders feel more comfortable learning on flat pedals, but it is all personal preference. If you are more comfortable on clipless it is acceptable. Be sure to bring your own pedals and shoes. If it is only raining we still ride and teach lessons. If we experience thunder and/or lightning, New Hampshire state law requires that we close the lift for 30 minutes for each occurrence. Is downhill mountain biking dangerous? Any sport can be dangerous, it all depends on how much risk you take. Having a safe and fun experience requires taking the proper steps to learn in a safe way as well as having the right equipment. We recommend starting with the Find Your Ride™ program. Our trained coaches can give you a foundation of skills to ensure that you have all the right equipment. We recommend familiarizing yourself with PARK SMART. This is the best way to understand signage around the mountain. 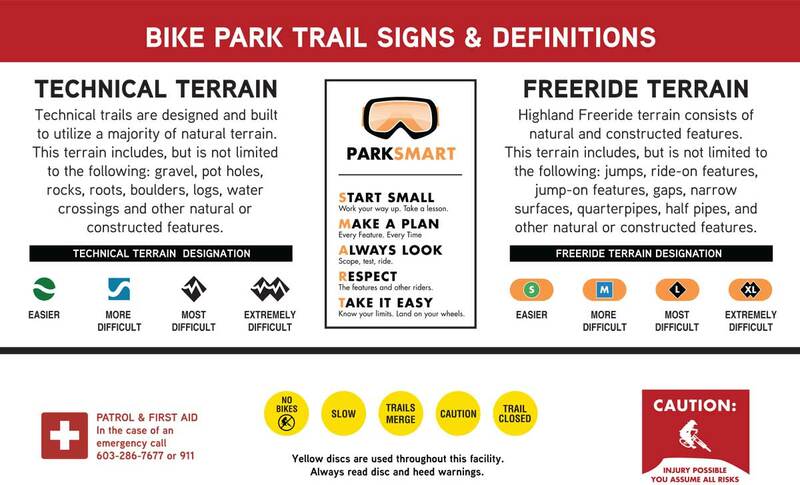 Understanding PARK SMART will help in learning the proper steps to ride downhill. What trails are the best to start on? Our easiest beginner trail is Freedom Trail. Other green trails include Easy Rider, Meadow’s End, Cat Scratch Fever and Hot Wheels.